Those glorious Arts and Crafts tiles from the 1920s have been on our mind lately, for a couple of reasons. The first is an exhibition that opened at Sacramento’s Crocker Art Museum on February 22 that’s devoted to the Berkeley-based company California Faience. 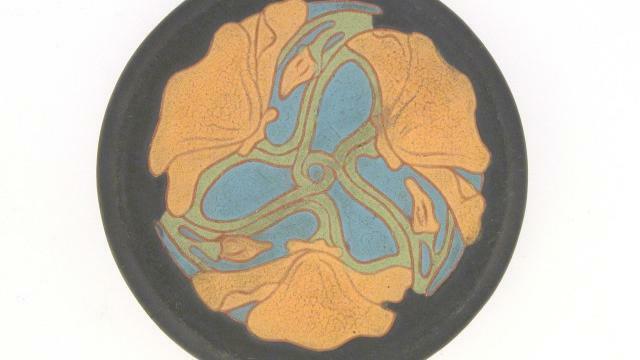 It includes this earthenware tile (above) designed by cofounders William Bragdon and Chauncey Thomas—those are, of course, California poppies. The second reason was hearing that a bakery in Burbank, Modern Bite, has created a line of sugar cookies iced with edible inks (below) to mimic the Malibu Potteries tiles used in the historic Adamson House, in Malibu Lagoon State Beach. (May Rindge, the founder of the potteries, used to live in the 1929 house; now it’s a museum, and part of the cookie money will be donated to it.) They really are almost too beautiful to eat. Almost. Exhibition: Of Cottages and Castles: The Art of California Faience; $10; through May 17; crockerartmuseum.org. Cookies: $30/box of 8; modernbite.com.